Basketball Leagues are offered in the fall for youth and teens. Boys and girls will have the opportunity to learn and improve their skills in this program. There will be one team practice during the week for one hour and a one-hour game on Saturdays. All children registered will receive equal playing time. 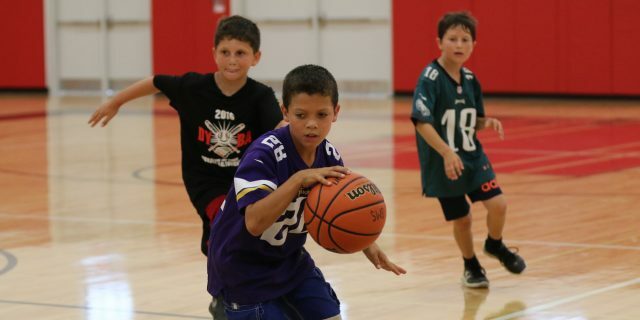 1st/2nd/3rd/4th grade teams will focus on fundamentals of basketball including shooting, passing, dribbling and teamwork. 7th/8th grade teams will learn more advanced basketball skills and team concepts. An end-of -season tournament will cap the 7th/8th grade league. Sections 03,04’s games will be played against teams from Deerfield, Lake Forest, Highland Park, and Glencoe Park Districts and will require participants to travel to these communities to compete depending on the game schedule. An end of the season tournament will be held at the end of February. Saturday, October 6, from 10:00-11:00 AM at the Sachs Recreation Center. Every parent of a child who is registered in the Youth Basketball League should attend this meeting. At this meeting the following areas will be covered: program goals, expected behaviors and responsibilities, and the philosophy of the program. Social development – meet new friends and learn how to interact positively with others in a team environment. Develop good sportsmanship – positive attitudes and attributes that can be applied to everyday life. Each team will be assigned one 1-hour practice on a week night at area schools. Practice will be held after 6:30 PM. Practices are assigned based on coach preferences. Please note any days that your child cannot practice on the player information form. Contact the park district for options if there is a conflict with your assigned practice time. Practices will begin the week of October 22. Each team will play one, 1-hour game per week on Saturdays scheduled within the range of times printed in this brochure. NO REQUESTS WILL BE ACCEPTED FOR ANY GRADE LEVEL. Skill evaluations (not try-outs) are run for the purpose of distributing talent as evenly as possible throughout the league. As much as we try, this is not a scientific process. Every player should attend their skill evaluation time listed on Thursday October 11 or Saturday, October 13. A player information form must be filled out with basketball registration. All children in the league must attend skill evaluations. Coaches should be on hand to rate the kids. Times for each league are listed in the general league description. League Registration will not be accepted after Friday, October 12 at 5:00 PM. Any player registration brought in after October 12 will be placed on a wait list and placed, if possible, after the team selection process is completed (Friday, October 19). If you are looking for some extra instruction, you missed your team practice during the week, or you just can’t get enough basketball, then come to the league practice to continue learning and developing your skills. There will be two practices per week run by park district staff beginning the week of November 1. Volunteer coaches staff our youth basketball league teams. The basketball program requires a lot of energy from a thoughtful, creative, concerned group of volunteer coaches comprised of parents and other adults who love sports and instructing children. Effective coaches fully support a positive youth sports philosophy in their attitude and behavior at practice, games and events. You help the players learn skills, discuss fair play and most of all, have fun. Look at coaching as an opportunity not only to teach sports skills, but also to achieve something far more significant –helping children reach their full potential. Interested volunteer coaches, should fill out a Coach Application. Download the application above or pick one up at the registration desk at 836 Jewett Park Drive.